how to avoid or prevent girdling of very heavy suspension bridge cable around tree. 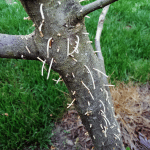 Wire damage can certainly harm the tree causing disease, pests and certainly girdling the tree. The only way to prevent it would be to remove the wire.